The following chart plots the average performance of the FTSE 100 Index during March since 1984 (more info on this type of chart). The chart shows that on average the UK market climbs for the first three weeks of the month and then falls back towards the end of the month. The average chart for February was posted a month ago here. The following reproduces that chart and overlays the actual FTSE 100 for February 2013. 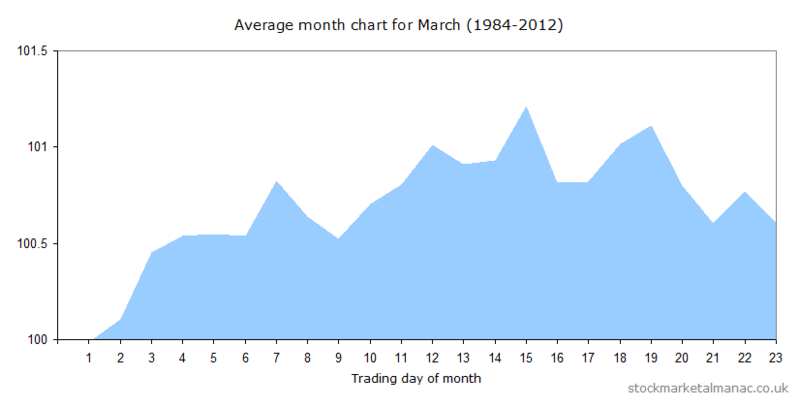 This entry was posted in March, Market, Month analysis, News and tagged average month, FTSE100, Mar by Almanacist. Bookmark the permalink.